I've just experienced the ffmpeg smear for the first time. I had no idea what it was until I started googling around for vertically distorted images, but there are lots of things on the internet calling it the ffmpeg smear, so that's how I found it and what led me to your forum. I've already found and fixed my problem, I just wanted to post this here incase it helps anyone else. I don't expect this is going to be the problem for everyone, but it's worth checking. It only started happening when I made some changes to my network so I had an inclining that it was network-related. Anyway, after sniffing around, I found a network issue. The switchport that my camera was connected to had fallen back to half duplex and my camera was on 100/full. I could see errors and collisions incrementing on the switch port. 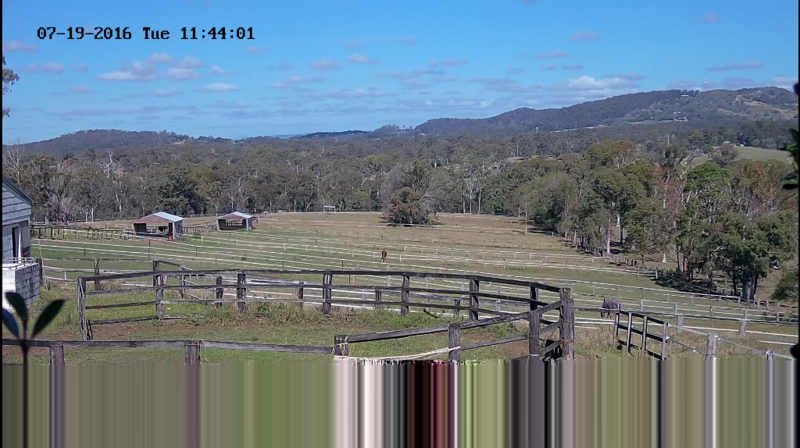 I set my switch's port back to 100/full duplex hard coded (to match the camera) and have been keeping an eye on it for a couple weeks and my smearing problem is gone. I've seen some places talk about it being a problem when UDP is used. I suspect that what you're seeing with the UDP stuff will tie in to a potential network problem, not necessarily an ffmpeg problem. Or at least making the problem worse if there is also an ffmpeg problem. UDP is a connectionless protocol.. it will just push data across a network with no verification that data got to the other end ok. If there are network issues, the sending device won't have any idea but you'll see problems on the receiving end (AKA: the video). TCP is a connection-oriented protocol, will verify that the data made it ok and if it didn't, it will take corrective measures to try and make it work. So by using UDP you're actually bringing out issues in the network. (Interesting side note but UDP is actually used to stress-test networks to intentionally expose any potential network problems). If switching to TCP is fixing some peoples' problems then I'd suggest anyone should check if they have a network issue rather than a camera issue. Admittedly that may be difficult to do if you're using residential-grade gear but if you have a managed switch, log on to it and take a look.